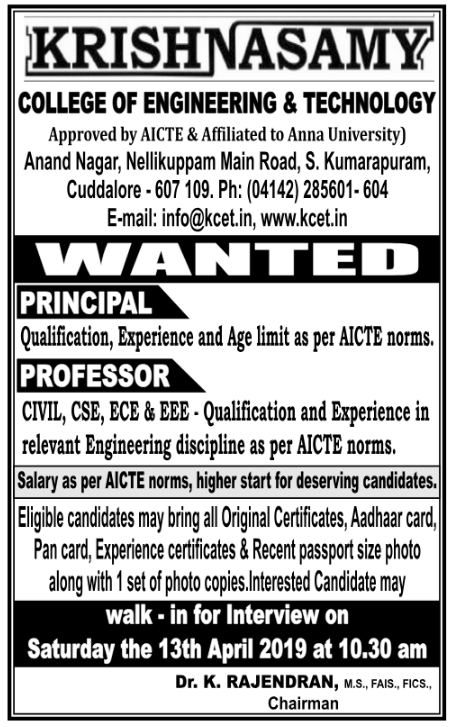 Krishnasamy College of Engineering and Technology, Cuddalore has advertised in the DINAMALAR newspaper for recruitment of Professor / Principal jobs vacancies. Interested and eligible job aspirants are requested to walk-in on 13th April 2019. Check out further more details below. About College : Krishnasamy College of Engineering and Technology was established in the year 2001 with a view to provide opportunities for the rural population in the backward district of Cuddalore to acquire Technical Education. How to Apply: Interested and eligible candidates are requested to attend the Walk-in interview by bringing their CV along with all original certificates, copies of certificates / testimonials, experience certificates, Aadhaar card, PAN card and recent PP size photos to walk-in address provided here.